OK so this post is a little late for you to get your pour ready for the Kentucky Derby, but you might as well enjoy this cocktail once this month. I bought a little too much mint (don't do that), so I have a few more probably to make later in the month. 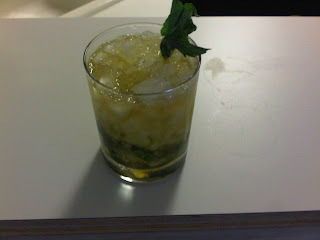 Take about 15 mint leaves and put them in a glass (if you have a julep glass or collins glass, awesome, but if not, use a rocks glass like I have inappropriately used above). Sprinkle in about a teaspoon of sugar (you can use more, it won't hurt) and a little bit of water (no more than a tablespoon). Take your wooden spoon or muddler and smash the mint leaves around and around until the sugar is no longer visible in there (this point is debated by julep fanatics, but is not debated by me). Fill glass to the brim with crushed (as finely as possible) ice. Add 2 1/2 ounces (I use a shot glass as a measuring device, but don't use one that's too big) of bourbon to the ice. Stir it up with your spoon, you should see some mint come up into suspension in the ice. Top it off with more crushed ice. Drink it, but hold it from top or bottom so you get a nice frosty frost on the outside of the glass. Congratulations to Animal Kingdom for winning the Kentucky Derby and also for having what I considered to be the worst name of any Derby horse in the running this year.